And perhaps the most obvious clue of what may be on the horizon: the gap between what TIPS (Treasury Inflation-Protected Securities) pay and the 10-year note is now at its widest range since September 2014. That means inflation has been rising much faster than what the 10-year bond pays. That’s right: Inflation is sneaking up. It’s not just me noticing. “Traders Bet on Faster Inflation in the World's Biggest Economy” declared The Street last week. The article points out that due to the rise in commodity prices (especially oil), a surge in manufacturing activity, and rising GDP in the US and around the world, investors are bracing for higher inflation than what they expected just one month earlier. On top of that, the tax cuts, wage increases, and recently imposed trade tariffs are also all inflationary. To whatever extent they’re right, it means the cost of gas and groceries will go up. Does it mean the gold price will rise? 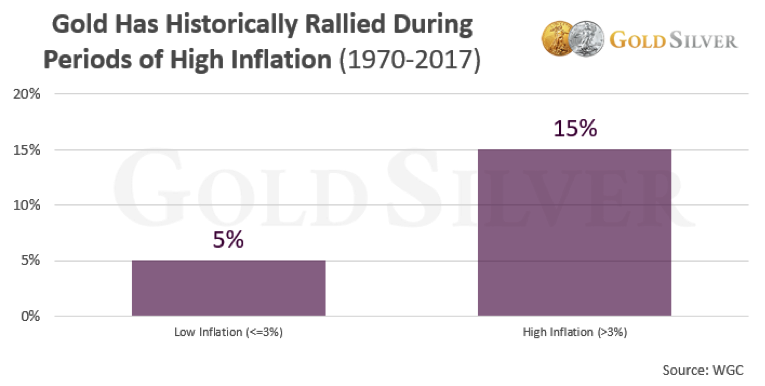 The World Gold Council came out with an interesting study that examined gold’s performance during periods of low inflation (3% or less) vs. high inflation (over 3%). The results confirmed what many of us instinctively knew. The data over the past 47 years is clear: Gold rises more when inflation is higher than when it is lower. So if inflation heats up this year, history says the gold price will move higher. Throw in the possibility of a sudden increase in inflation, one that catches people off guard, and we could see a sharp rise in the gold price. And given the fact that inflation trends are not measured in months, but in years, you have the makings for a long-term move up in gold. If inflation becomes a new reality, it could easily kick-start the next major bull market in gold. Either way, investing in the current environment is less about a specific path and more about crisis. More important than predicting the future is to prepare for it. Today that means holding a meaningful amount of physical gold and silver.